This is for normal scheduled maintenance jobs that are booked in. This is for high priority jobs. Fast call out. Starting from faulty electrical circuits, breakers tripping off, flickering lights, dodgy old-fashioned sockets, there are lots of situations when one must seek assistance from a professional electrician, who is efficient, experienced, and has a credible reputation in the market. While a large number of agencies claim to resolve the said issues seamlessly, modern-day consumers tend to rely upon David Love Property, who have established a well-defined network of highly talented electricians ready to serve 24 hours per day. 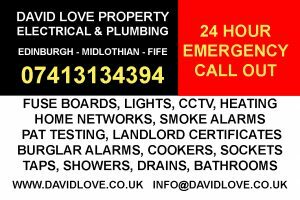 One of the leading providers of electrical services, David Love Property and the team have catered to the requirements of industrial, commercial, and residential sectors in various locations such as Edinburgh, Dalkeith, and Midlothian. Installation of lights, ceiling fans, smoke detectors, power points, wall mounted TV’s, etc. Repairs of ovens and water heaters. Upgrading or replacing switchboards, light fittings, mains, etc. Solutions to wiring, surge protections, and other designing productions especially in the household sectors of Edinburgh, Dalkeith, and Midlothian. With the ready availability of fixed price quotations over phone, this entire organisation has quite successfully satisfied the Edinburgh market. The charges are very reasonable for a professional electrician. David Love Propery is a quality choice when compared to other companies in business because all the projects here are carried out with utmost caution by the top-notch electricians in his team. They are available to work 24 hours per day and are on stand-by for an emergency call out. Owing to an extremely comprehensive and reliable approach, our services are doing good trade in Edinburgh, Dalkeith, and Midlothian.